14ymedio, Eduardo Marín, Santiago de Cuba, 21 January 2019 – Santiago de Cuba has lived an unusual week. Not only have the temperatures cooled and long sleeves become more frequent in the streets, but the winds of good music have also blown. For the first time, the Plaza Jazz Festival included presentations and concerts in this city in eastern Cuba. O’Farrill showed that his family ties to Cuban music from his father are not only a matter of blood inheritance but that his interpretations are permeated by a mixture of audacity and folklore. He reached the climax of the presentation when he performed the danzón Bodas de Oro (Weddings of Gold) with his two sons and the conga santiaguera. 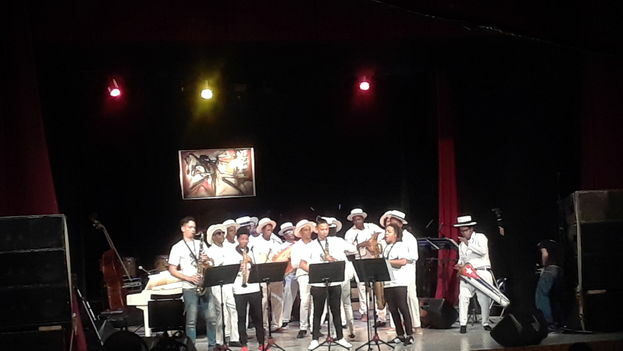 The jazz festival program also featured throughout the week the Colombians José Tobón and Sigura Jazz Ensemble, the Canadians Stich Wynston and The Shuffle Demons, along with a good number of Cuban musicians and students from the Esteban Salas Conservatory. However, the final weight of the event was more inclined towards genres such as son, rumba and salsa due to the existence of very few jazz groups in the province. This musical reality was described by one of the members of the Vocal ConPaz quartet, Gualveris Rosales, who defined the Festival as “50%” jazz. For several attendees consulted by 14ymedio, the fact that there are few santigueran groups dedicated to this genre born in the United States is due, in part, to the lack of presentation venues destined for its dissemination. “Jazz needs an atmosphere, a more intimate space in which the viewer and the musician connect better,” said Isaac, a young man who was at the Plaza Dolores for the closing of the Festival on Sunday. So at the closing of the santigueran edition of Jazz Plaza the majority of the public came to dance with Ronald’s drums and his Rumbera Explosion, rather than with the cadence of the saxophones and piano.